Helping people in your neighborhood never got easier. The product we propose is a mobile application that will support people in disaster recovery efforts by helping the delivery of resources – manpower or material resources – to people in affected areas. With our system, we aim to facilitate volunteering and help material and information requests locally in a systematic way through a multi-platform system. Users can register with the system at any time, although registering during disaster preparation phases would be suggested. Alternatively, local and national nonprofits could enlist the skills of their volunteers in the system, so that their volunteers could be matched for volunteering according to their skill sets. The envisioned system would have a user verification component to allow only trusted people in the community to join the platform through a cross-check with other people in the community. There is currently a lack of solutions on the market for disaster recovery. When facing disasters, people may lack certain necessary resources and may need people to help them recover in the aftermath of the disaster, etc. Examples of recent disasters include Hurricane Sandy (2012), Toohoku earthquake and tsunami in Japan (2011), 9/11 attacks (2001). In all these occurrences, people in disaster-hit areas tend to come together and unite as a whole community often to help each other and reach out before governmental support can reach them. This can include anything from emotional support, to providing food and water, cleaning up debris, fixing broken things around the neighborhoods or getting local resources information. However, there could be a lack of these needed resources in the affected areas in the aftermath of the disaster. The people in these areas could benefit from human and material help from proximate non-affected areas, as the people there would be able to deliver resources to them. Research indicates that building a network on Facebook to request favors can have many factors to the responses a request might get; for us specifically, we want to support individual benefit for which we might provide within a tool where exchanged favors between users might be more visible or emphasize requests for help within the application over other types of messages. People often experience more closeness to their community when an area goes through a disaster together, and we aim to help facilitate the local, community collaboration with our application. Likewise, it has been researched extensively as to how people use social media platforms to “serves as resource for situation updates and as platform for coordinating activities, exchanging opinions and emotionally coping with a crisis”. Keeping the researched factors about crisis management and social collaboration during crisis in mind, there could be a system that could be integrated as part of the disaster planning for local collaboration in times of need. The prototype for CommUNITY was created using Axure RP 7, a prototyping software suite. 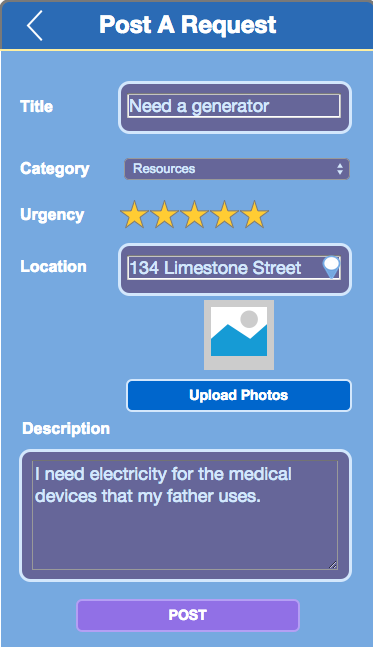 Users can consult the map and the corresponding list of requests to see what the other members of the community need. They can answer requests by initiating a conversation with the person requesting assistance. Users receive notifications when somebody contributes to a conversation that was already initiated, when somebody responds to one of their requests, and when a new user requests an invitation code to be able to use the application. 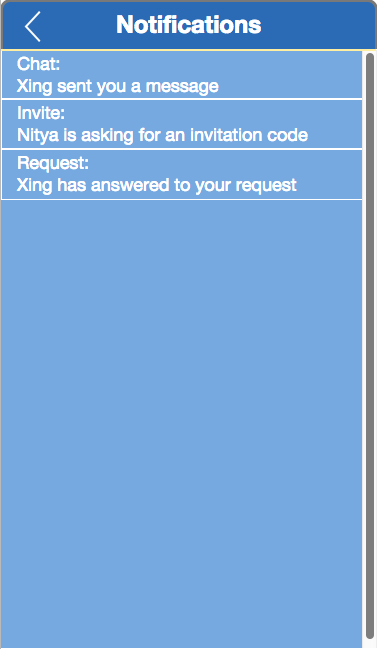 Users can create requests simply by tapping *Create a Request* on the main screen. They can then name their request, choose the category, and add a description of the problem/what they need and pictures to help other users identify clearly what the need is. Also, they add information about their location so that the system can display the request on the map. 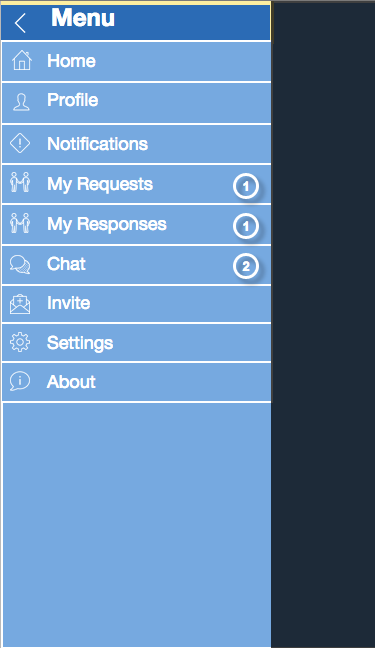 In order to provide a safe space for communities, people requesting access to CommUNITY need to be verified through either an invitation code provided by an active user of the application or through the Ask a Neighbor feature, where people select the faces of users that are already registered within CommUNITY. The latter will receive a notification asking them to verify that they know the person requesting the access to the application. Users can start a conversation with other users from the main screen. 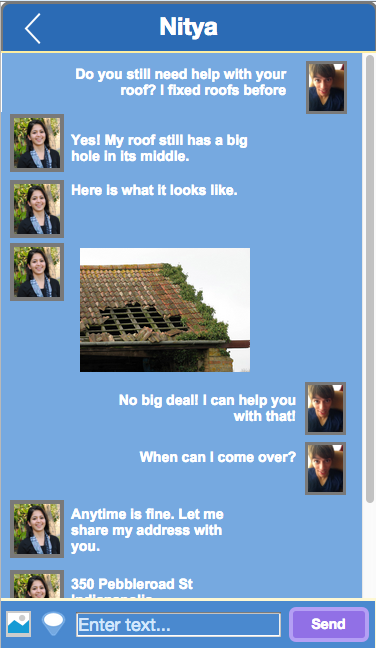 The conversation screen allows users to send pictures and location within the chat. The menu, which can be opened from the main screen, offers an access to the different features of the application. Numbers next to the features indicate the number of new items that require the attention of users, such as a new message or the response to a request. Below is the presentation of CommUNITY recorded on Dec. 11, 2014 at IUPUI. 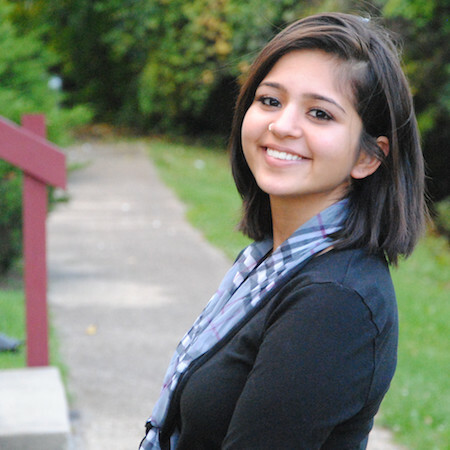 The team behind CommUNITY is composed of three IUPUI doctoral students: Victor Cornet, Nitya Verma, and Xing Yu. More about them by clicking on their pictures below. Indiana University – Purdue University Indianapolis (IUPUI) is the premier urban campus of Indiana University and Purdue University in Indianapolis, Indiana, United States. As the first school of its kind in the US, the IU's School of Informatics and Computing is an innovator in a fast-paced and dynamic field. 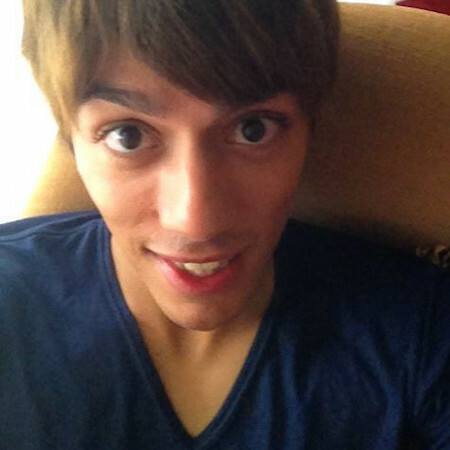 Victor was involved throughout the entire process, like his fellow team members Nitya and Xing. They together came up with ideas that would lead to the design of BrainFree. He collaborated with them on all the deliverables. He interviewed two people for the conceptualization survey, and one person for the evaluation survey. Victor also built this website with content provided by the entire team. This project was a collaboration between Xing, Victor and I; together we came up with our problem space and brainstormed for ideas to formulate ideas into solutions. I helped with the conceptualization of our idea and conducted interviews with possible users about what they would require from the application to establish needs. Also, I created low fidelity sketches to put our idea on paper and out of the abstract form. After that, I helped create a high level prototype through Axure; then we conducted iterative interviews to improve the prototype and fix major problems with it. With our evaluations completed, I put together our midterm report with the other members. Xing has been through the entire project from the beginning. He contributed to the prototype from multiple aspects: problem space forming, requirements gathering, design conceptualizing, prototype building and evaluation. 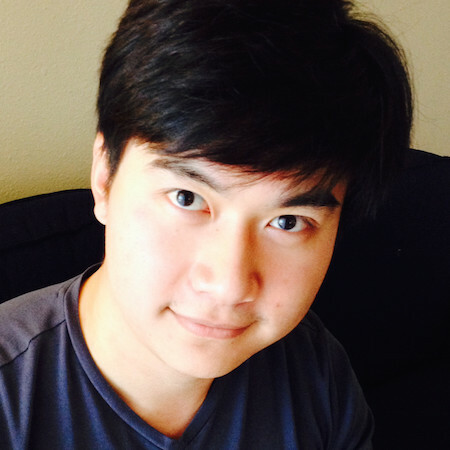 Xing took lead in building the high fidelity prototype and creating the scenario video.